When Paul Thomas Anderson started his career with the impressive one-two punch of Hard Eight (1996) and Boogie Nights (1997), he was touted as an exciting young filmmaker that wore his influences on his sleeve, most notably the work of Jonathan Demme and Martin Scorsese. With his ambitious epic Magnolia (1999), he added Robert Altman to the list of cinematic influences. Punch-Drunk Love (2002) was a game changer of sorts that saw Anderson start to move away from the sometimes show-offy camerawork of his first three films to a more restrained style with an emphasis on character. There Will Be Blood (2007) was a towering achievement – a fascinating study of one man’s all-consuming greed. With this film, Anderson favored long takes that allowed his actors to work their magic and dive deep into their characters. The Master (2012) continues in this fashion but sees Anderson eschew a traditional linear narrative for something more abstract as he focuses on the turbulent relationship between two men. Early speculation suggested that this film was going to be a scathing look at Scientology, a cult created by science fiction author L. Ron Hubbard in the 1950s. Anderson tried to dispel these rumors and, to be fair, The Master is more concerned with the origins of a Scientology-like cult and explores what motivates its inception and what draws people to it. Like There Will Be Blood, The Master features a battle of wills between two diametrically opposed men with Freddie representing chaos and Dodd representing order. 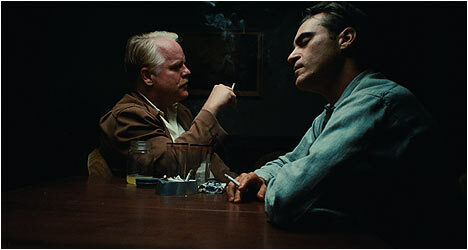 These characters are impressively portrayed by Joaquin Phoenix and Philip Seymour Hoffman with the former playing the wild id to the latter’s controlled ego. Phoenix has never been better, continuing to grow as an actor by tackling unconventional roles and making unusual choices while inhabiting them. He brings an exciting unpredictability to the volatile Freddie. Hoffman is an ideal foil as the self-important Dodd who sees himself as a great man, but is nothing more than a con man. Where Freddie externalizes everything Dodd internalizes, which makes him something of an enigma, initially, and this is what Freddie finds so fascinating. An interesting thing happens over the course of the film. At first, it seems that Freddie is an easy character to figure out, while Dodd comes across as inscrutable, but as we spend more time with these characters it becomes evident that Freddie is a harder person to read – we never get a handle on what makes him tick exactly – while Dodd reveals his true nature. The scenes with Phoenix and Hoffman, of which there are many, are electrifying as they play off each other so well, especially in a scene where Freddie submits to “The Process” – a series of questions that Dodd asks him in an attempt to break down his inhibitions and dig deep within himself through millions of years and past lives. Phoenix and Hoffman deliver riveting performances in this absorbing drama about the dangerously seductive allure of cults like The Cause that prey on the disaffected by convincing them that they have the answers to their problems. With The Master, Anderson has created another powerful film about people pushed to their limits and looking for answers to the questions they have about life. Some people find it in religion or philosophy and for some they spend their whole lives searching. “Back Beyond” is 20 minutes of outtakes and deleted scenes. This collection of odds and ends provides a little more insight into the characters. Also included is a collection of teasers and trailers that actually features more footage that was cut out of the final film. “Unguided Message” is a behind-the-scenes featurette that amounts to a collection of fly-on-the-wall footage of the film being made.